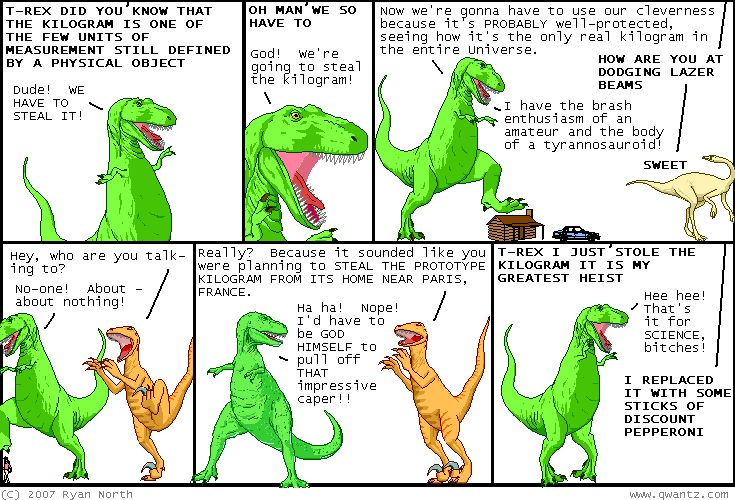 Dinosaur Comics - January 12th, 2007 - awesome fun times! January 12th, 2007: I got a few emails asking if I was talking about Randall's amazing xkcd in my last comic about obscure humour! I was actually talking about myself, although we are both guilty of making computer programming jokes! WAIT DID I SAY "GUILTY" I MEANT "PLEASED TO"
Also the comic before that, about zombie epidemiology, raised some concerns about the viability of zombies. Anders Sandberg was rad and simulated the spread of zombies, assuming both fast and slow (good and sucky) zombies, which can also evolve. I HAVE SOME BAD NEWS: they are going to win! I guess it depends on which kinds of zombies you start out with. If you've got evolving zombies, then man, I don't know what to tell you. They're the future. We're doomed! Plus, they leave a much smaller ecological footprint.